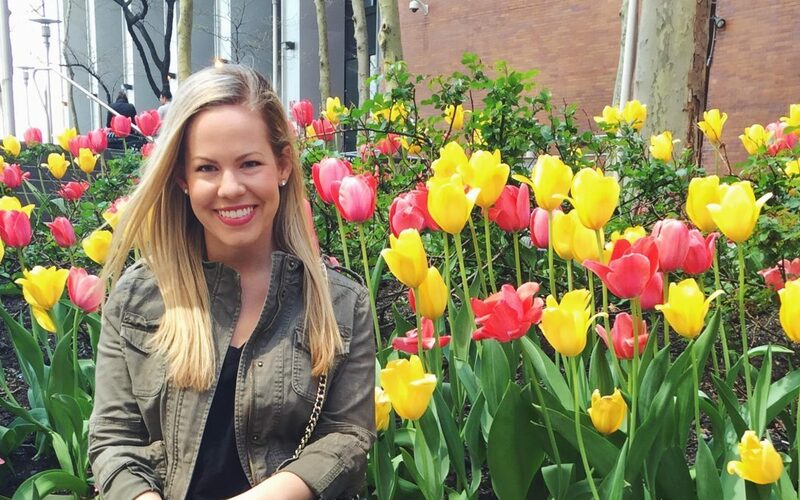 I’m excited to share part two of my travel planning series – how I organize my trip research. If you missed part one where I discuss how I research for my trips, make sure to check it out here! 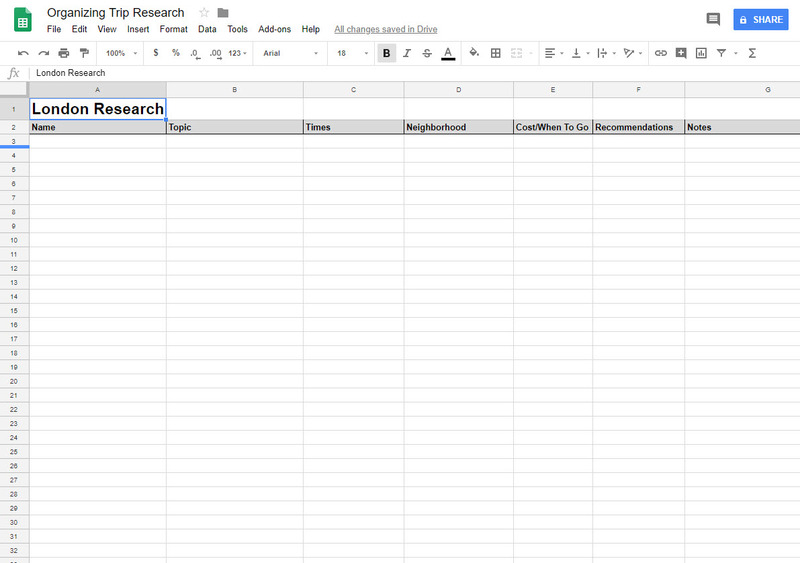 This post takes all of that research and explains how I organize it in the most useful way I’ve found possible. It has been tried and tested through my vacations over the past few years all over the U.S. and Canada. 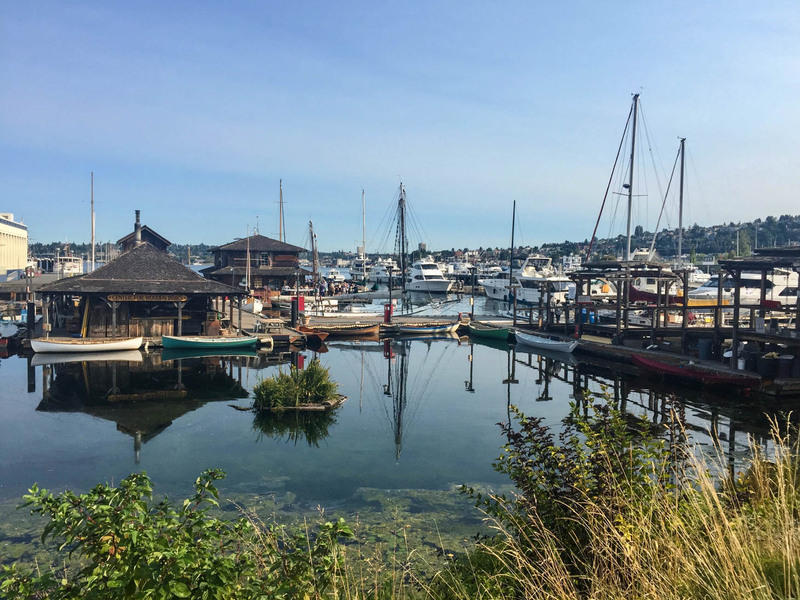 The Center for Wooden Boats in Seattle! Name – What is the name of the place? Times – What time(s) is the place open? Are they closed on any days? Double check holidays too! *To save time on putting together this spreadsheet, only put exceptions that will affect you. For example, if you will be visiting a city from Monday to Thursday, no need to write out “Closed Sunday” unless you want it for future reference. Neighborhood – What neighborhood is this place in? I tend to generalize this slightly…based on what I can tell on Google Maps and how I perceive it. Continuously looking at the map helps me to learn the streets/neighborhoods without even trying. So helpful! Cost/When To Go – I usually use the $-$$$$ range, and include any pre-fixe menu prices here. For example, in my London research, most “afternoon teas” are a set price. I’ll also include if there’s a specific meal/time of day that appeals to me most there, whether it’s the menu, cost or specials like happy hour. Recommendations – I like to be reminded of who recommended what place. If I see it featured on trusted travel guides, I’ll include that too. Notes – Think of this column as an extension to the “topic”, which is very vague. To keep it simple, I usually copy & paste the Google place description. If there isn’t one, I go to the “About” of the restaurant/bar website itself. You want this section to be no more than a few sentences, if that, and to serve as a reminder of what’s what. I’ll often change the wording to be my impression of the place while I researched it should anything have stood out. I’ll also include recommended food/drink items. This is the last column because it’s the longest. (Optional) Reservations/Tickets – Sometimes it’s helpful to note or put a link to where you can book reservations/tickets. I use OpenTable whenever possible! (Optional) Links – If you would like, you can put a link to the place’s website in a final column. I don’t find this necessary because if I want to quickly look at a menu somewhere, I’d google it on my phone and find it faster than I would via my Excel document. Whatever works best for you! After or while you are filling out this information, always make sure to wrap the text (directions: Format < Text Wrapping < Wrap) and shrink rows/columns where possible! You should be able to see every column at once on the screen in front of you, without having to scroll much, if at all. In order to narrow down your research, I like to put the places I’m most excited about in green that are more of the “must-go’s.” In red, I’ll put places that I don’t think are appropriate for this trip. They could be too expensive, not have an exciting menu, etc. Since I already did the research and don’t want to forget I already looked at it, or think I might want to go to that place in the future, I won’t delete it completely. If you want, you can also separate the restaurants/bars from the activities/attractions. I personally find it easier for everything to be together via neighborhood for putting together an itinerary (part 3 coming soon! ), but it’s up to you. Just remember, in Google Sheets/Excel, you can always sort via different columns and ctrl/cmd-f to find specific places without an aggressive scrolling search. For example, if there’s an open space in my itinerary and I’m in the mood for Asian cuisine, I can search that or sort the spreadsheet by my “topic” column. If I feel like I spent too much money last night and want a cheap bite for lunch somewhere, I can sort by cost. The problem with Google Sheets and Microsoft Excel is that they are not very smart phone-friendly (even with the Google Drive app on my iPhone 8+). 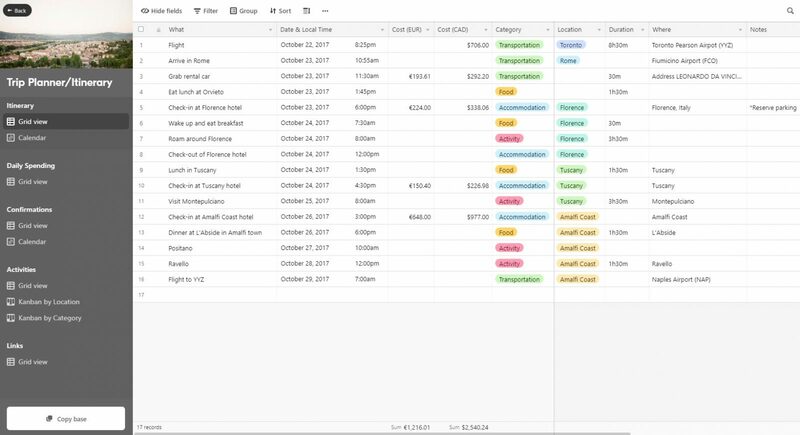 I was so excited to recently discover AirTable’s “Trip Planner/Itinerary” template base, and plan to use it during my Europe trip. You can very easily import your spreadsheet from Excel (directions: export from Google Drive and save as .csv to your desktop), with minimal formatting changes. It takes a little getting used to, but works very similarly to Google Sheets/Excel. The left most column/column 1 is fixed/stays in place – the grid view allows you to scroll horizontally across the page but leaves column 1 in place. This is why the Airtable app works WAY better on the go than Excel. It color coordinates categories – if you love to color-code, you will love this! You can customize it to your liking, too. I think it makes it easier/faster to look at as it differentiates various topics or neighborhoods by color. 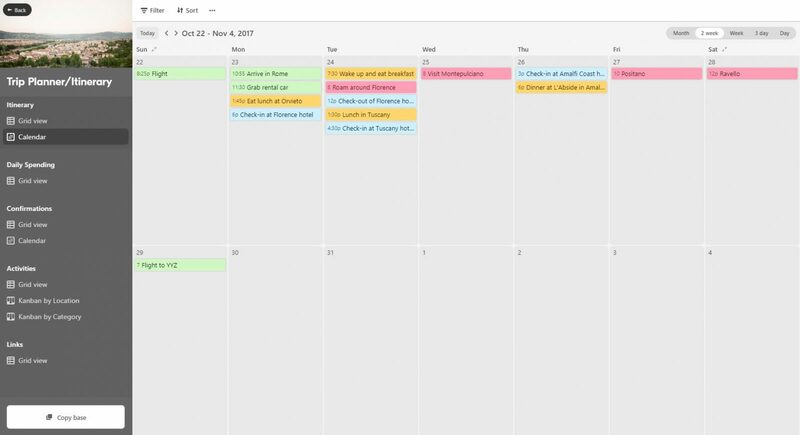 You can also use this same app for your itinerary – the calendar view option makes this an amazing itinerary template by including columns for dates and times of booked reservations, tours/tickets, and travel plans. I hope you found this useful and not totally insane. Part 3 of this series will be able how I strategize, put together and format my itineraries. 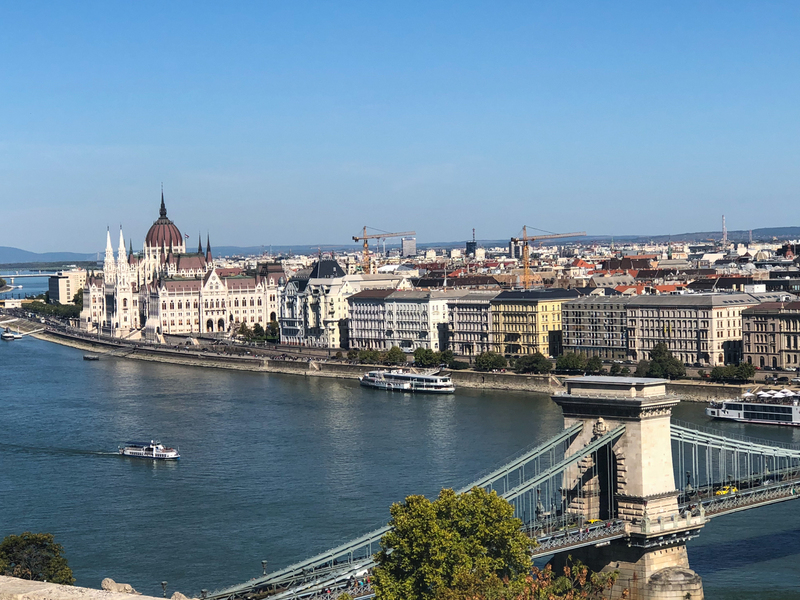 I am still in the researching/organizing phase for my upcoming Europe trip, but should be moving on to itineraries for each city next month. Have you used AirTable before? If so, I’d love to know about your experiences! If not, how do you organize your research for trips? I’m always open to new ideas. Thank you, as always, for reading!